Photo courtesy of Jean Potter A male yellow-bellied sapsucker clings to the trunk of a tree. Worldwide, there are almost 10,000 species of birds. After awhile, you begin to wonder if thinking of unique names for each of these species began to deplete creative reserves. Then again, some of the names given to birds suggest someone really wanted just to have fun at the expense of birders and nature enthusiasts. After all, you have to be careful about shouting out bird names like blue-footed booby, great bustard and hoary redpoll in mixed company. There are also bird names that just don’t make a lot of sense — names like dickcissel and phainopepla — even to birders. Then there are names that are oxymoronic, including greater pewee and giant hummingbird. There are some bird names that sound like fighting words that bring into question concepts like courage and honor. Indeed, I sometimes think people are waiting for a punchline when I inform them there truly is a species of bird known as the yellow-bellied sapsucker. Photo courtesy of Jean Potter A male yellow-bellied sapsucker visits a suet basket for a quick meal during a recent cold spell. I focused on the downy woodpecker, the smallest member of the woodpecker clan in a post from a couple of weeks ago. This week I am exploring one of the family’s oddball members, the aforementioned (and much maligned) yellow-bellied sapsucker. In profile clinging to the trunk of a tree, the yellow-bellied sapsucker is a rather pudgy, especially for a woodpecker. The sapsucker has black and white plumage enhanced by red foreheads in both sexes. Male sapsuckers also have a bright red throat patch. Both sexes also show a large white stripe on their black wings. And yes, there is enough of a pale yellow wash on the stomach of this odd woodpecker to justify the descriptive “yellow-bellied” as part of its common name. Photo by Bryan Stevens This yellow-bellied sapsucker was photographed during a Christmas Bird Count. Sapsuckers harvest sap by using their bills to drill various sorts of holes into the bark of a tree. Some of the more shallow holes, which are usually made in a rectangular fashion, must be maintained on a frequent basis for the bird to continue to derive sap from the tree. These holes — known as sap wells — not only provide nourishment to the sapsucker but to other birds, including hummingbirds, that appreciate a quick sugar fix. Insects also come to these wells, which function as sticky traps to capture the bugs so they can be eaten later when sapsuckers or other birds return to inspect the wells. 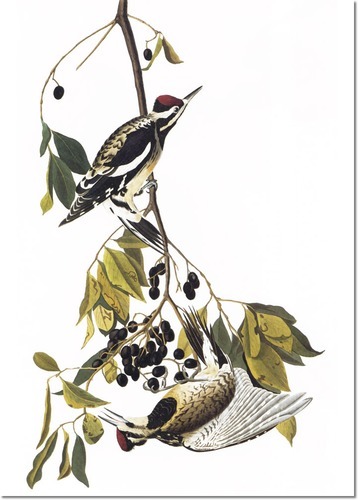 Early naturalist and artist John James Audubon painted the yellow-bellied sapsucker, known during his time as the yellow-bellied woodpecker. Although they tend to prefer trees like maple and birch, sapsuckers are known to feed on more than 250 different varieties of trees. Indeed, they actually do feed on the trees. Not only do these birds subsist largely on sap, they also feed on the cambium layer in the bark of a tree. The sapsucker also supplements its diet with insects, fruits and seeds. Unlike other members of the woodpecker clan, sapsuckers do not visit feeders all that frequently. 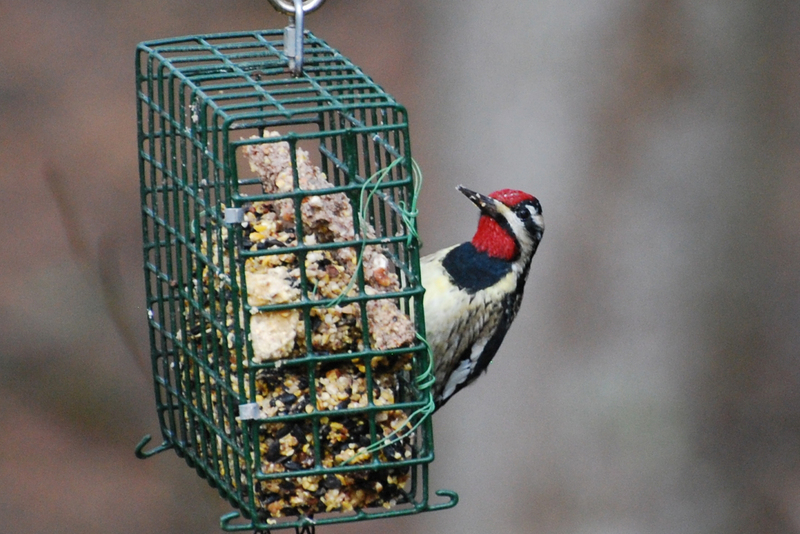 When a sapsucker does visit a feeder, it is often lured there by the promise of suet. While most woodpeckers attempt to tough out the winter season in the same region where they spent the summer, the yellow-bellied sapsucker is migratory. Ahead of the coldest months of the year, sapsuckers migrate to the southeastern United States, as well as the West Indies and Central America. During the summer months, most sapsuckers nest in forests across Canada, Alaska and the northeastern U.S. states. There is also a small population of breeding sapsuckers in the Appalachian Mountains of Virginia, Tennessee and North Carolina. The yellow-bellied sapsucker has a call that sounds amazingly like the meow of a cat. I know about this call from personal experience. While birding in South Carolina a few years ago, I searched diligently for the source of such a call. It sounded somewhat like a gray catbird — another mimic of the common household feline — but not quite. Now I know that when I hear this unusual call I can train my binoculars on the branches and trunks of nearby trees to scan for a sapsucker. Photo by Dave Menke/U.S. Fish & Wildlife Service The red-breasted sapsucker, shown here, is a relative of the yellow-bellied sapsucker found in the western United States. 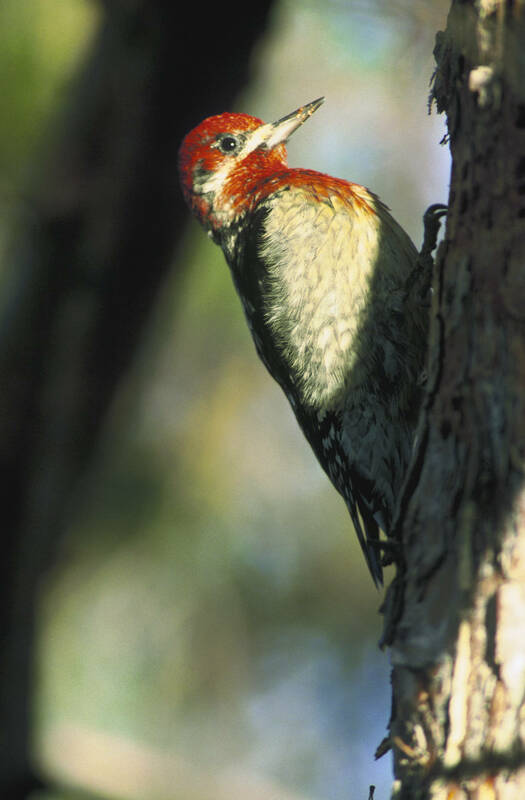 There are actually another three sapsucker species — Williamson’s, red-breasted and red-naped — in North America, but they are all birds of the western half of the continent. It is true of many species of birds that males and females look different. 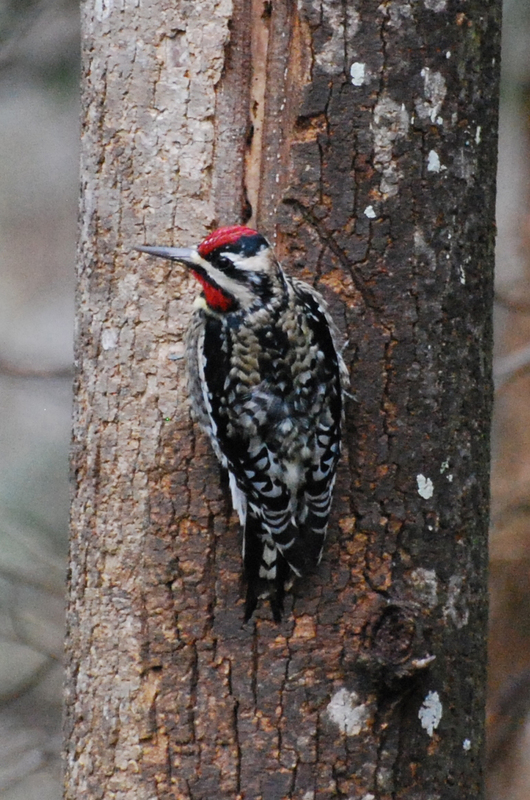 In the case of the Williamson’s sapsucker, males and females look so different that early naturalists mistakenly believed the male and female were entirely different species! Only two decades after the initial discovery of this bird did scientists finally realize that both male and female Williamson’s sapsuckers were the same species. This particular sapsucker was named in honor of Lt. Robert Stockton Williamson, who led a surveying expedition that collected the first male. The intent of the expedition wasn’t focused on collecting birds. Williamson and his men had actually been assigned the job of identifying the best route west for a railway to the Pacific Ocean. I’ve actually seen very few yellow-bellied sapsuckers at my home, but it isn’t too difficult to find this bird during fall migration and in the winter months at city and state parks in the region. 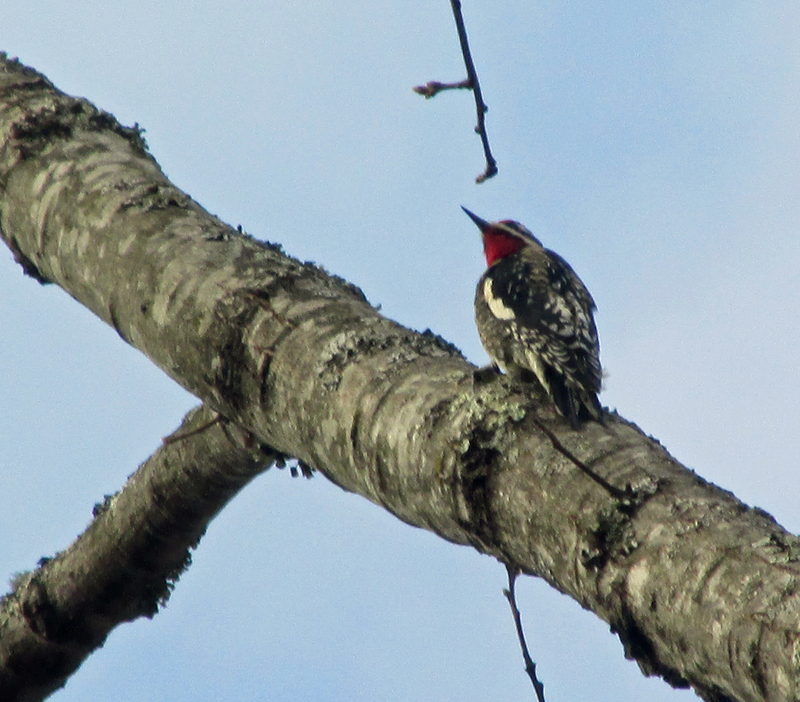 If you observe a yellow-bellied sapsucker in your own yard, consider yourself lucky to get a glimpse of this oddball woodpecker. This entry was posted in Birding, Birds, sapsuckers, Woodpeckers and tagged Birding, birds, Bristol Herald Courier, Bryan Stevens, Carter County Compass, Elizabethton Star, Erwin Record, Feathered Friends, McDowell News, Our Fine Feathered Friends, sapsuckers, The Erwin Record, Woodpeckers, yellow-bellied sapsucker on February 14, 2016 by Bryan Stevens.